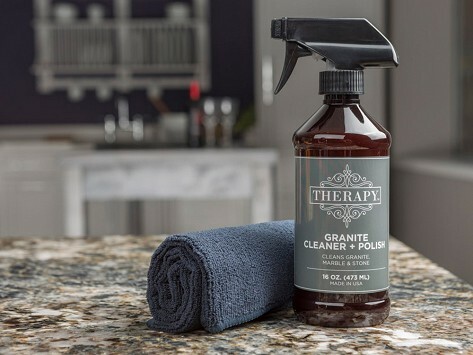 This granite cleaner takes a plant- and bio-based approach to cleaning up in the kitchen. The non-toxic, eco-friendly formula is made with a coconut oil-derived ingredient and has a neutral pH that’s safe for surfaces like granite, marble, quartz, and onyx. The cleaner removes messes like grease, oil, and dirt and leaves a streak-free glossy finish in its wake. Essential oils provide a light, subtle fragrance. Made in the USA and includes a microfiber polishing cloth. Dimensions: 2.25" x 2.25" x 8.5"
Therapy Clean Maker James Dudra spent 10 years formulating green cleaning products with plant- and bio-based formulas to be tough enough for kitchen clean-ups. He finally landed on an unlikely source of cleaning and polishing power—coconuts. All of Therapy Clean’s non-toxic cleaners are made in New Hampshire with a coconut oil or a coconut oil-derived ingredient. Beyond cleaning, they add polish to surfaces without leaving streaks. James kept things eco-friendly while rounding out the formulas of the stainless steel, wood, granite, and glass cooktop cleaners. All are scented with essential oils, so there’s no harsh chemical-y smell. Calcium carbonate (aka the scrubby stuff in toothpaste) provides non-abrasive scrubbing in the glass cooktop cleaner and the granite cleaner has a neutral pH that’s safe for granite, marble, and quartz. Sprucing up wood surfaces? That cleaner is gentle enough to use on furniture, cabinets, and even antiques.